These terms describe certain kinds of inflamed skin problems including allergic contact dermatitis and nummular dermatitis. It can present as pink, red, brown or even lightened skin color with bumps, scales, patches or blisters that usually are itchy. It can occur at any age but is most common in infants and young adults. 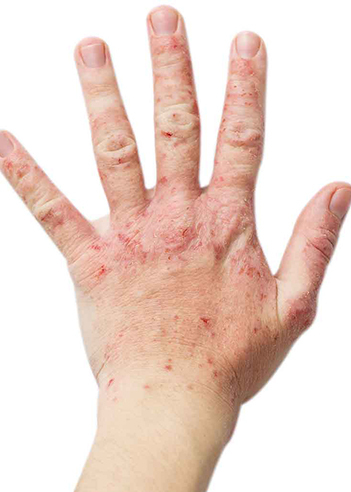 The rash can be limited to a few areas or widespread. Proper, early and regular treatment can bring relief and may reduce the severity and duration of the disease. We can advice you on avoiding irritating factors in creams and lotions, in addition to other environmental precautions.